What Kind of Dog Snow Boots Should You Buy? My personal favorite boots for small breeds, and the one's I would pick for Cooper (11 pounds) and Max (16 pounds) are the Zipper boots. They come in solid black or black and blue. 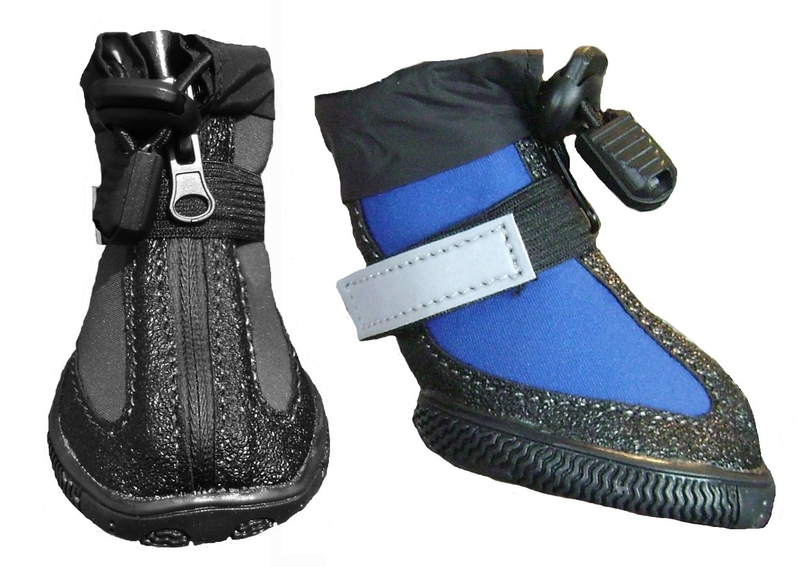 Made of rubber and neoprene, these booties go on easily and have a 3 step waterproof closure system, consisting of a zipper, elastic velcro and adjustable drawstring closure to ensure dry paws! They are great for all size dogs however I recommend these for the hard to fit tiny dogs. The 3 step closure system really keeps them on little paws. One of the newest products to our winter collection is the Camo Boots. The color makes them idea for hiking and hunting, however they also double up as great snow boots! 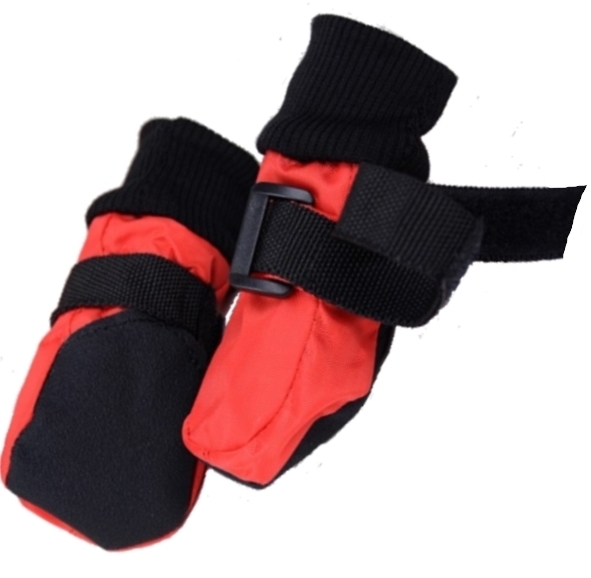 They're made of waterproof nylon and have a thin fleece lined interior to help keep paws warm. They have good traction on ice and are so easy to put on because the opening starts at the bottom of the boot. 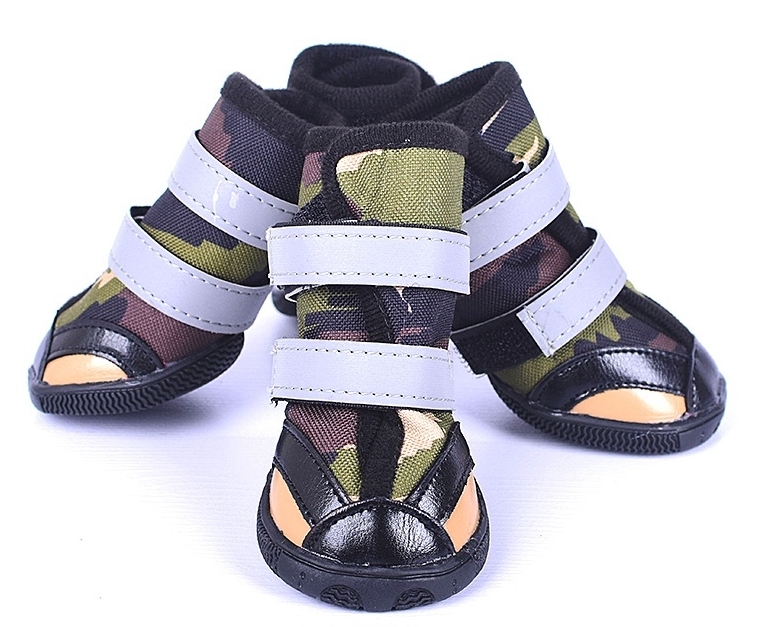 The 2 straps of Velcro help keep them (only 1 strap for sizes 1-3). These are a great additional to your dog's winter or hunting wardrobe. 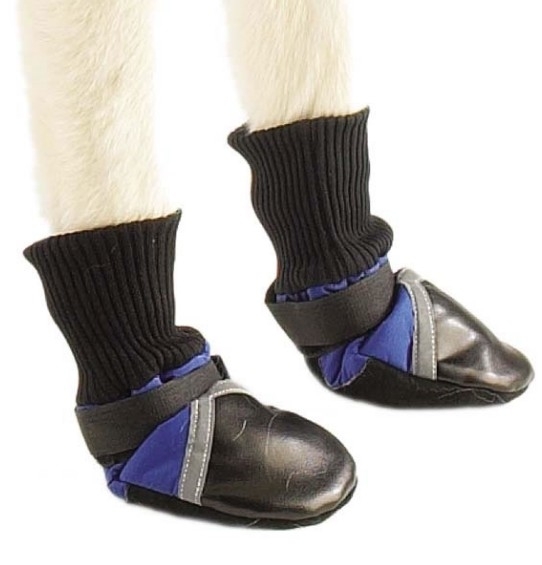 For those of you who keep your dog's hair short and have no time to put boots on the hyper-love, you may want to consider Paws rubber booties. They are quite literally balloons. They slip on easily, and can be worn multiple times as they are disposable. They're actually the #1 selling dog boot for winter because dogs walk easily in them because they can feel the ground beneath them. However, they are made of rubber and they may be somewhat difficult if you have a very long haired dog. Rubber and wet hair don't go too well together! 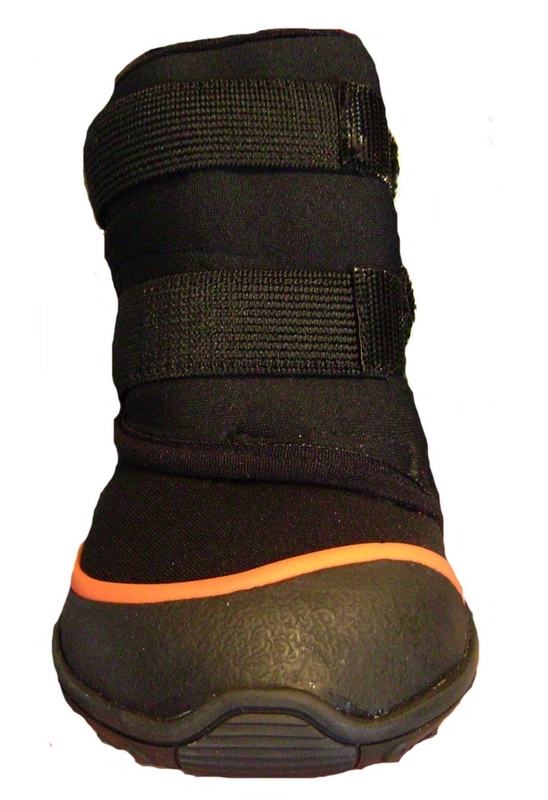 For those budget conscious dog owners, you may want to consider Guardian Gear Dog Booties. I'd suggest them for dogs who are at minimum 8 pounds, as they tend to be slightly stiff at first. Bigger dogs will have an easier time forming the shape of the boot. These boots are not too stylish, not to trendy, but easy to put on and will certainly keep paws dry and frost free. Best of all, they are very economical! For those of you with large breed dogs (these fit small breeds too), or if you don't want to fiddle with zippers and rubber and just want a no-nonsense boot then you should take a look at the soft sole dog boots booties. They have a warm fleece interior and are made with a soft sole so that your dog can properly feel the ground beneath them. They are easy to put on with one Velcro strap. 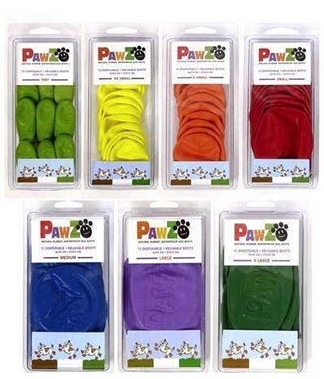 They aren't great for traction but will certainly keep your dog's paws dry and warm in the snow. These are the easiest winter boots to use. They come in both blue and red. Our Pawtrexx boots are heavy duty, no nonsense winter boots. Made of neoprene (same material used to make scuba diving suits) they keep your dog well insulated, dry and comfortable. They go on and off easily and fit the largest breed dogs. They stay on well with their double Velcro system and have excellent traction on ice. These are our toughest dog boots and they are highly recommended for winter. Hi-Toppers are for deep snow! 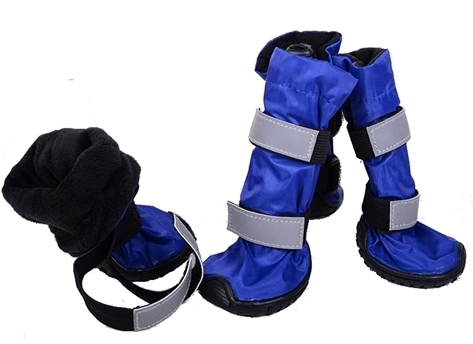 These boots have a fleece interior and a waterproof nylon exterior and are sure to keep paws and legs dry. Like the Pawtrexx boots, they have a non slip sole that can combat icy driveways and the elastic Velcro will wrap tightly around 2 points on your dog's leg. Like the Pawtrexx boots, they have a non slip sole that can combat icy driveways and the elastic Velcro will wrap tightly around 2 points on your dog's leg. These are a customer favorite for winter! And who could forget dog slippers? These are a must have in any paw-wear collection. 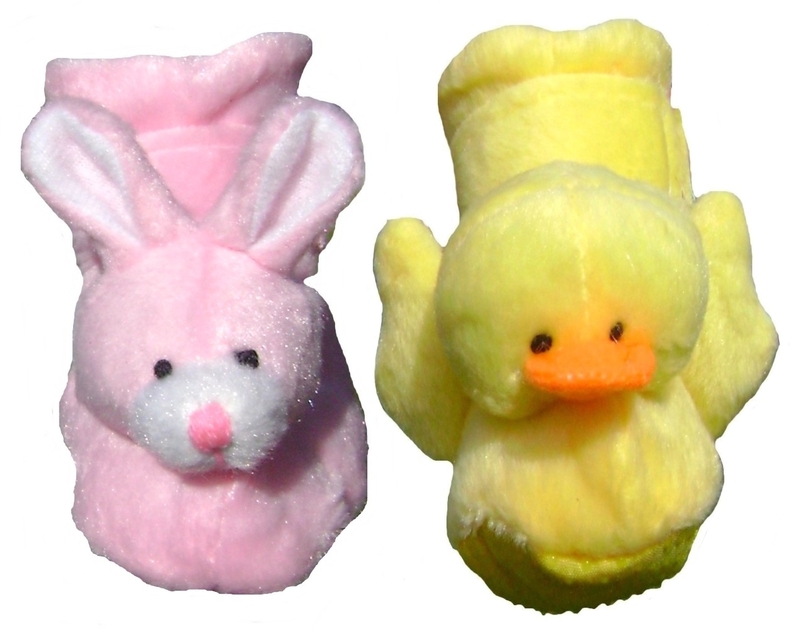 Yellow duckies and pink bunnies are sure to make any dog mommy or daddy smile. There's nothing cuter than seeing your dog in animal slippers. Plus you can get away with it in winter because they will keep your dog's paws warm in the house. You and your dog can wear matching slippers. It's totally practical. Really. 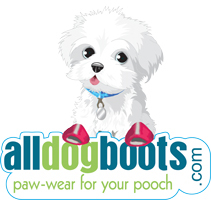 There are so many dog boot options out there that it may be very confusing, especially if you are a first time dog boot buyer. We hope we have made this process a bit easier. If you are wearing boots in the snow, so should your dog. Protect paws from cold, rain, snow and nasty road chemicals. If you need additional help with sizing or selection please contact us.